"They say the world used to turn. They say that night would follow day in an endless dance. They say that dawn rose, dusk fell, and we worshiped both sun and stars. That was a long time ago..."
The Moth Saga, a bestselling fantasy series, tells the story of Moth, a world torn in two--its one half always in sunlight, the other cloaked in endless night. 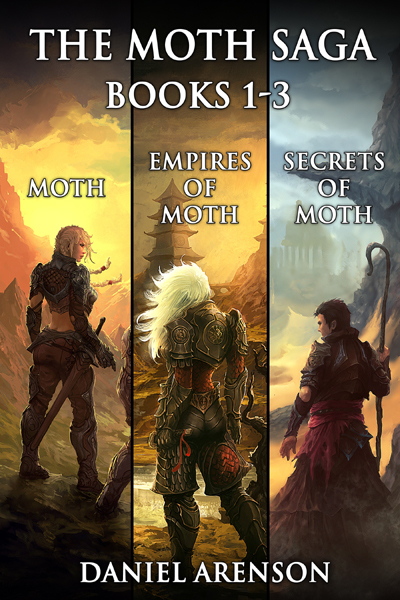 This bundle includes the first three novels in the series: Moth, Empires of Moth, and Secrets of Moth. Many eras ago, the world of Moth fell still, leaving one side in perpetual daylight, the other in darkness. Torin and Bailey have spent their lives in the light, but now they're about to venture into the dark . . . and discover a world of danger, secrets, and wonder.